Being a developer is something that gives you great pleasure. The science can explain why this happens. Developers are driven by goals like creating code and seeing it being used for an useful purpose. What happens when you develop your code and you implement a feature that works well, or even when your test suite passes 100% of the tests, there is a huge release of dopamine on your brain. That is a chemical that starts propagating from neuron to neuron when you are on the verge of achieving a desired goal. It is associated to rewarding behaviors and makes you feel good for what you achieved. When developers stop writing code and implementing features, they will miss this reward. So if you tell a developer to stop coding so they can work on other aspects of a business that they do not feel that can be rewarding, they will not want to stop being a developer. Fortunately it is possible to create a software product business without giving up being a developer. Actually there are ways to continue to work as developer all the time. Watch the video below to learn about how you can enjoy the independence of working on your own software product business and still continue developing your code. At the time of this writing, this video is still being edited. 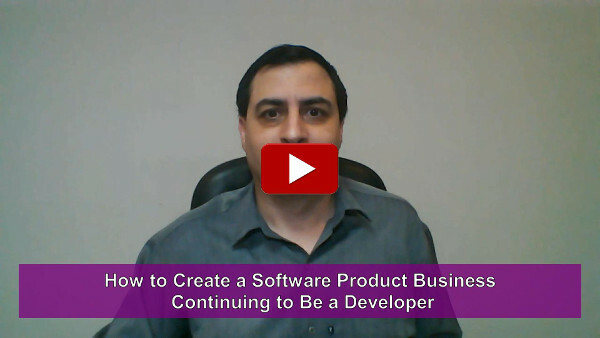 In the page of the video on "How to Create a Software Product Business Continuing to Be a Developer" there is a link to signup with your Facebook account or signup with your email address, so you can be notified when the new video is ready.